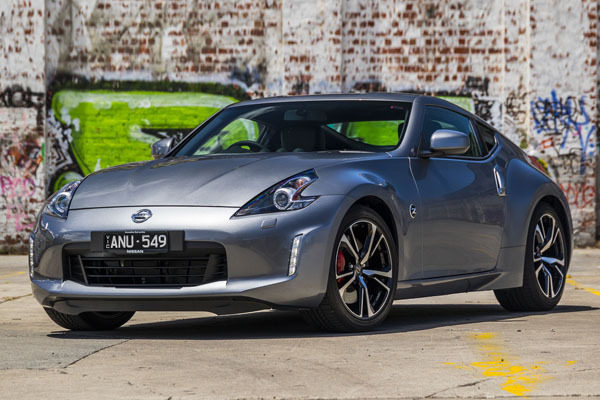 The popular Nissan 370Z has received a slight update, a price cut and minor styling changes as the Japanese manufacturer looks to reposition the distinguished coupe as an affordable and timeless offering. We have always had a soft-spot for the 370Z and there was great excitement when it replaced the 350Z in 2009, and a somewhat more tempered pleasure with subsequent refreshes over the last decade. Taking it home for the week was a nice way to get reacquainted with a favoured friend. Amazingly, the Nissan 370Z continues to defy the ravages of time when it comes to exterior appearances. Somehow, its sporty proportions, sloping lines and proud stance remain current despite the passing years. Nissan has made some minor changes with the 370Z showing off new 19-inch alloys, and a smoked finish on the front and rear lights and door handles. 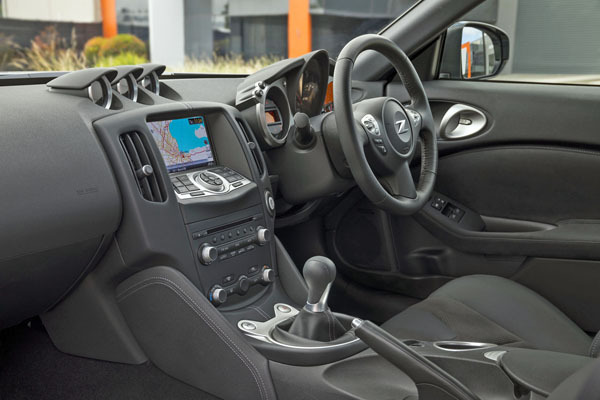 The three hooded gauges on the top of the centre console coupled with the oval instrument cluster lit by a tinge of orange is a quick visual indication that the interior of the 370Z has remained much the same. It is nostalgic and quirky and that alone can almost compensate for those instances where dated design impedes functionality. The steering wheel, for example, is adjustable for height only while the manual handbrake which makes a rare outing here takes up valuable space. Still, the seats – a mix of real and not so real leather – are supportive and comfortable even though getting in and out in a skirt can be quite an accomplishment. The instruments, while simple, are easy to read with dials and buttons all close to hand. Storage is not so crash hot with just one cup holder to fight over, small door bins and a shelf behind the seats that is all but impossible to reach when you are driving. The boot, though shallow, can deal with a couple of overnight bags or five green supermarket bags if you are willing to play a bit of Tetris – just remember which bag the eggs are in. The 370Z comes with a reasonably-equipped features list with keyless entry, push-button start, electrically adjustable seats, satellite navigation and an eight-speaker Bose audio system with noise cancelling as standard. A 7.0-inch colour touchscreen sits in the middle of the dash, angled slightly towards the driver. It is easy to navigate, quite intuitive actually, and we found Bluetooth connectivity responsive. The screen is also used for the rear-view camera with the picture offering predictive path guidelines. A 3.7-litre naturally-aspirated V6 takes pride of place under the bonnet of the 370Z. It produces 245kW of power and 363Nm of torque and is paired with either a seven-speed automatic transmission, or a six-speed manual as was the case in our test car. This upgrade introduces the high performance Exedy clutch which Nissan says produces better gear changes and makes the Nissan 370Z more responsive and fun to drive. The 370Z is not rated with ANCAP or NCAP but you can rely on stability and traction control, eight airbags and ABS with brake assist and EBD. It does miss out on the latest driver-assist technology, so things like blind-spot monitoring and automatic emergency braking, which are regarded as advantages in new cars. The thing that makes the 370Z fun is that you have to actively drive it. It requires engagement and concentration and a real willingness to find that sweet sport between the clutch and accelerator, the ability to find the right gear for the job and quick hands to support the nimbleness under foot. Do it well and you will be rewarded with an entertaining drive whether it is a quick nip around the city or speeding along the motorway. 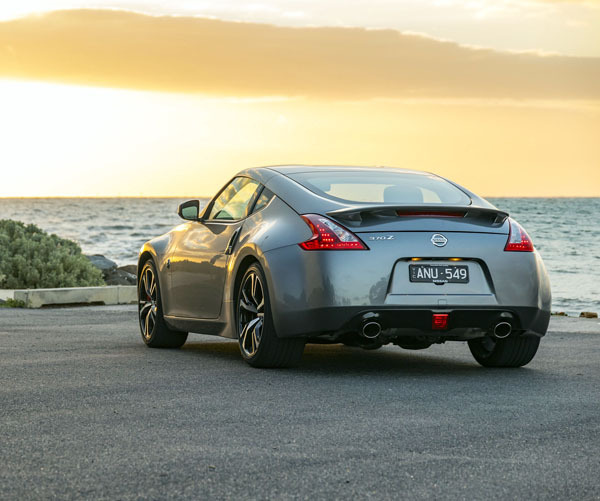 The 370Z is beautifully balanced and always enthusiastic, traits which are supported by an enveloping seating position for an enhanced driving experience. A firmish suspension to combat body roll means that you may feel the odd bump but it generally remains quite composed holding well to the road even when pushed around more challenging routes. The naturally-aspirated V6 that still powers the 370Z presents a conundrum. While response is good and it is lovely to hear the revs building, maximum power and torque are only available at the top of the range so it sometimes feels like you are always hunting for that elusive sweet spot. Opting for a sporty turn will see you paying for that privilege at the bowser. Official fuel consumption figures for the Nissan sportscar stand at 10.6L/100km but we used at least three litres more over that distance. Nissan offers the 370Z with a three year/100,000km warranty which doesn’t seem much given some of the longer warranties offered these days, but there is a capped-price servicing program for six years/120,000km and free roadside assist for three years. The 370Z may getting on a bit but it is still able to deliver a fun involved ride in a segment with a dearth of competitors. It has an attractive sticker price, genuinely good looks and makes a compelling case for old-school character and rear-drive thrills.